The FOMC meeting concluded Wednesday (May 2), and Fed watchers were left trying to decipher the Fed's summary of its decision-making. Its statement introduced the word "symmetric" in an effort to balance interpretations that may seem too "hawkish." Yes, I know, we're reduced to guessing what message the Fed's trying to telegraph by parsing esoteric word choices. But analysts seem to agree that the Fed is not anxious to get ahead of inflation. Inflation has been running above 2% for several months, and that could become a major spark for gold prices. So could a weakening dollar. It was a rough start to last week's gold trading as the dollar extended its rally. 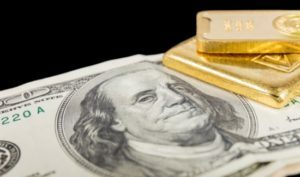 The U.S. Dollar Index (DXY) rose from 91.5 to end Monday (April 30) at 91.85, pushing gold back to $1,315 as the markets began anticipating the outcome of the Fed's meeting on Wednesday. As the DXY climbed further on Tuesday (May 1) to 92.45, gold lost another $12, to close at $1,303. Despite their hit on Monday, gold stocks were unphased by Tuesday's weakness and climbed. That continued again on Wednesday, the day of the FOMC meeting, even as gold climbed only $2. It certainly gave the impression of a sign of exhaustion for gold stock sellers, suggesting that $1,300 may hold as support for gold. The Fed declined to raise rates, and despite a post-announcement dip, the dollar rose further, to 92.75. 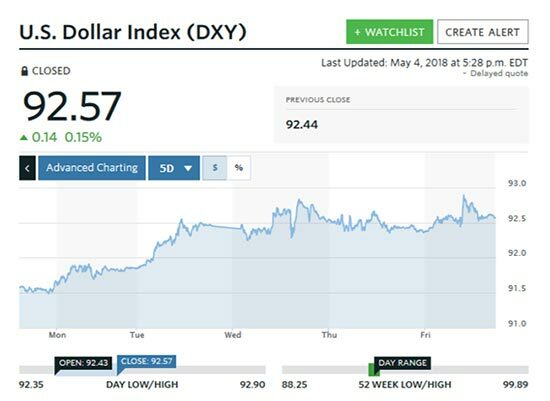 By Thursday (May 3), the DXY was back around 92.5, and gold traders finally digested the Fed's statement, factoring in the expected three more rate hikes this year. Gold prices rose on the day, ending at $1,312. To end the trading week, the dollar rallied initially on news of the unemployment rate falling further, to 3.9%. Gold popped then dropped back, though ultimately climbed to end the week at $1,315, as the DXY retreated to 92.57. 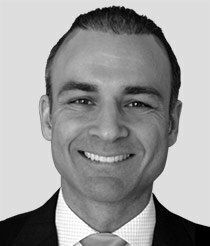 While the dollar's relationship to the price of gold is no secret, how the dollar's strength moves over the coming months will be the key driver behind gold prices.